Fevers can frighten any parent but they are especially scary to parents of infants. Many people don't know if fevers are dangerous or how to handle them. This article will focus on fevers in children 12 months old and younger. 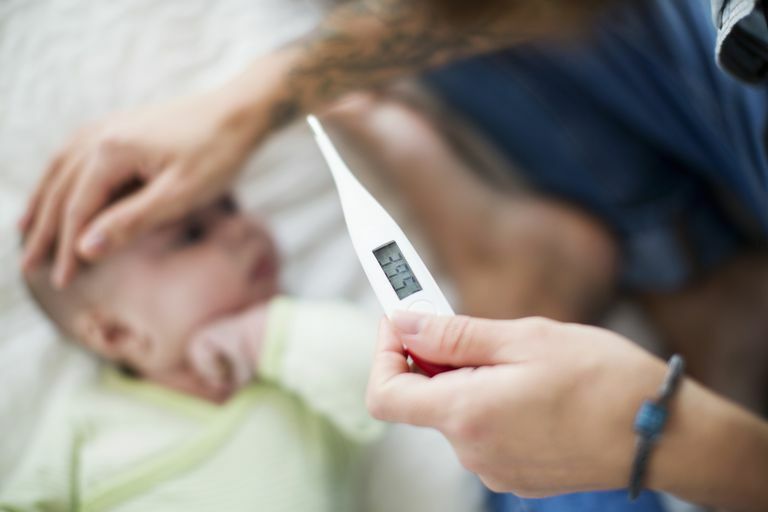 Before you get too concerned about your baby's temperature, it's important to know what is actually considered a fever. Many people believe anything over 98.6 degrees F is a fever. But that is not accurate. Our body temperatures fluctuate throughout the day. Babies and children can have even larger variations in their "normal" temperature. Unless your child has an underlying medical condition and his healthcare provider has told you otherwise, a temperature is not considered a fever until it is over 100.3 degrees F. So if you are concerned because your child's temperature is 99.9, don't be. Babies generally tolerate fevers well. However, when it comes to children under 12 months old, there are certain numbers that you should watch for. Any temperature 100.4 degrees F or higher in an infant younger than 3 months requires medical evaluation. It's pretty uncommon for babies this young to run fevers (unless they have gotten vaccines in the past 24 hours). If your child has a fever at this age, she needs to be examined by her health care provider. Special tests may be needed to see if she has a serious or life-threatening infection. If your child is between 3 and 12 months old and has a fever over 102.2 degrees F, contact his health care provider. The fever is not a danger to your child but the illness or underlying cause of the fever may need to be treated. No. Fever is one of the many ways our bodies fight off infections. Children tend to run fevers more often than adults do and will frequently have them with illnesses as mild as the common cold. The presence of a fever does not indicate something is seriously wrong with your child and the fever itself will not harm him. Although they are frightening to witness, febrile seizures typically cause no harm to the child who experiences it and they do not occur simply due to high fevers, like many people believe. Fevers and febrile seizures do not cause brain damage and a majority of children who experience febrile seizures do not develop seizure disorders. If your baby has a fever and it doesn't require a call or visit to the doctor, there are several things you can do to help her. The fever itself is not a reason to give medication, but if your baby has a fever and is fussy, isn't eating well or generally is acting like she feels bad, giving a fever-reducing medication is okay. Children under 2 months should not be given any fever-reducing medication. Tylenol (acetaminophen) is safe for children over 2 months old. Motrin or Advil (ibuprofen) is safe for babies over 6 months old. Do not give aspirin to a child. You can also try fever-reducing techniques that don't involve medication like taking off extra layers of clothing, giving lukewarm baths (not cold) and encouraging extra fluids. Perhaps the most important thing to understand about fevers in babies (and kids of all ages) is to treat based on how they behave, not the number on the thermometer. As long as the temperature doesn't meet one of the criteria listed above and your baby is acting like himself (smiling or happy and playful), there is no need to be concerned or even do anything about it. If your baby has a fever for more than 48 hours, even if it isn't very high, contact her health care provider to see if she needs an appointment. "Fever and Your Baby". Health Issues 20 Aug 15. Caring for Your Baby and Young Child: Birth to Age 5. American Academy of Pediatrics. "When Your Baby or Infant Has a Fever". Medical Encyclopedia 04 Dec 13. MedlinePlus. US National Library of Medicine. US Department of Health and Human Services. National Institutes of Health. What Does Clubfoot Look Like? How Does Edema Affect Premature Babies?